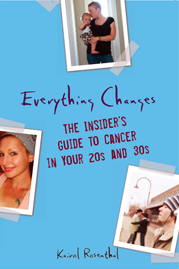 Everything Changes – The Guide to Young Adult Cancer » Getting Rid of Cancer Memories? I saw this linked on twitter and I was quite interested to read because I’m having trouble letting go of certain things, especially those things related to my ex boyfriend. I met him in January of ’09 and I was diagnosed with thyca in May ’09. The relationship was not a good one–for various reasons–but he became my world when I was diagnosed, through my surgery (he was there in the hospital the night after) and radiation. He put up with my rage, sadness, and debilitating hypochondria afterwards. He was very understanding and for those crucial months he helped me get through it all. Then, towards the end of ’09 things started to change and I could see that I could support myself without total emotional support from him (it took a long time to see this). The relationship ended in early ’10 and still I kept seeing him because I associated him with being the roots that kept me grounded. He was there with me during cancer, but that’s about the only good out of the relationship. I still think very highly of him in this respect. Which brings us back to his stuff. I have clothing, and other items and letters he has written me that I still feel like I need to keep up until recently. I think it’s time to remove that period of my life and move on. It has weighed very heavily on my shoulders and I think it’s time to let go completely. He was a part of my life when I had cancer, but there’s no more cancer… I think it’s time to get rid of him too. Yep, based on what anonymous said above, it can be really challenging when the object you need to get rid of is a person – or their letters, or sweaters, or photos. I dated a guy during cancer treatment who was so selfish and not a great caregiver. When we were dating he often wore my grandfather’s sweater. It looked great on him. Now I’ve had to give the sweater away. Instead of seeing my wonderful grandfather in it, I started seeing in it my jerky boyfriend. I think this is less of a lesson about cancer and more of a lesson about not letting people you date wear your relatives clothing! Get rid of such things. It’s the right decision. P.S.- That he wore the sweater of your grandfather seems to me a bit odd anyway. So glad you’re cleaning house and letting go, purging and hopefully splurging on some very cool PJs! I envy that – can’t seem to let some things go, though am about to release something very big that has been giving me a bitter and metallic taste in my mouth for years… It has to do with cancer, but not what you’d think. But enough about me – again, I’m thrilled for you and once again proud OF you and TO KNOW you! Kairol – I’m smack in the middle of cleaning out my office because in 10 days my job of 23+ years is ending. Some of what you’re saying about the things that surround you has been hitting home for me this last week as I go through file drawers and boxes, tossing or recycling. I lived so much of my life on my job, and my co-workers were part of my support system. There were dozens of cards, the “fell better” stuffed bears, the various tiny angels. Those don’t take up much space (although I tossed the cards) but the thing that was taking up emotional space for me was a poster-sized “Glad You’re Back” welcome with signatures from everyone in the building. It’s been hanging off the bottom corner of my bulletin board since I came back from my first cancer surgery in the summer of 2005. Most of the people that signed it have either moved on, transferred to other sites, or will retire with me in the next couple weeks. And I knew, looking at that poster board, that it was something I just didn’t need anymore. Friday, I cut it up to the recycling-appropriate sized pieces and put it in the bin with the contents of a half-dozen notebooks I didn’t need anymore either. I had a desk with five drawers, two overhead bins, and a five drawer lateral file cabinet – all filled with “stuff.” A lot of it is cancer stuff, reprinted articles and notes and cards and well-wishes – good luck talismans and strong thoughts. But I realized going through it all that I didn’t need to carry that weight with me any more – it wasn’t grounding me, it was holding me back. So I recycled or tossed most of it – and will go home with three small banker’s boxes of files and coffee mugs (I can always use those!) and office supplies. ‘Cause the important part was that my friends’ thoughts carried me through, and I can’t put those things into a box. So I also find myself moving forward in new directions, respecting that sometimes less is more. Hi Kairol, I very much agree with you, I used to be a saver and now I am discovering that I have a much easier time getting rid of things. I think cancer helps you realize what’s really important in our lives, like friends, happiness, physical, emotional and mental health. I think it is part of the American Way to acquire “stuff” and hold onto it. That good ‘ole cancer survivor wisdom shows us that holding onto stuff just weighs us down, as well as complicating things. It doesn’t surprise me at all to hear that many survivors want to simplify and pare down in as many ways as possible. Enjoy the new pjs!!!!! I wished I was at that point where I can get rid of stuff, like wigs and get well cards. Right now, technically it’s in remission but bc it’s metastatic, the onc just says it’s a matter of when…so at what point can you declare yourself a survivor and free yourself of the memories, when they’re with you every moment? I lost 300 GB worth of data (pictures, books, things I’d written and stored over the years) when my external hard disk crashed a few weeks ago, and I spent a few hours wallowing in self-pity about having lost everything. This also included my chemo diary, a photo-journal of my cancer treatment nearly two years ago, which I still look at sometimes. Anyway, now I have reached a kind of zen state where I realised I don’t really need to look at pictures to remember. And maybe this is a good way to learn not to get too attached to material possessions. I hope this zen state lasts long enough to reduce an apartment full of stuff collected over the last three years to fill up a 30 kilo suitcase in two weeks’ time when I leave my current country of residence to newer pastures. And oh yeah, I have never been able to wear all the baggy clothes I wore during chemo and radiation again. It has been good for me to remember that I can shed things in stages. After my second treatment I decided to get rid of all the cards sent to me, but I saved five of them and put them somewhere special. I don’t need to ditch everything at once. Horrible memories can serve a purpose. Dwelling in cancer mode can be an important part of healing. And so is moving on. It isn’t linear, or tidy. Thanks for the link to the article. In response to your question about wrist bands: I don’t care if other people want to wear them. Me personally – no thanks. Two decades ago, cancer awareness was an incredibly important goal. And I think we have achieved that goal. We can cross awareness off the list now and move on to other strategic issues such as: 1. How to get health care coverage to more patients so they aren’t dying just because they cannot afford treatment; 2. Create a scientific environment in which certain kinds of research are prioritized, and outcomes are shared. Political pressure, policy support, and critical thinking are what is needed for the current cancer agenda and I don’t think bracelets can accomplish much were that is concerned. DEVI, Hope your moment of zen lasts a long time! And PAT good luck in packing up and moving on. It sounds like a huge shift. Lastly, Nordstrom Rack was very good to me in the Calvin Klein pj department. Ever feel modal? Dang that stuff is soft!